After a thrilling Rose Bowl comeback victory by the Georgia Bulldogs, and a revenge-filled Sugar Bowl win for the Alabama Crimson Tide, we now have the matchup set for this year’s 2018 College Football Playoff Championship in Atlanta on January 8. With both university campuses within a three-hour drive of Mercedes-Benz Stadium, demand for tickets to this years CFP Final is higher than ever before. 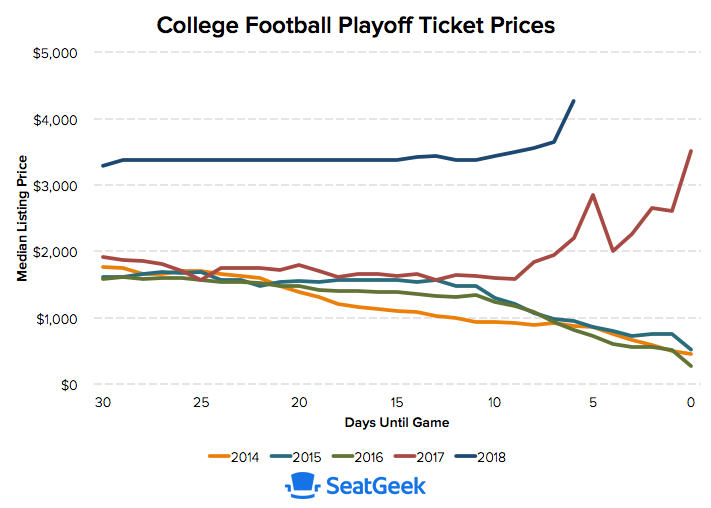 Ticket prices–which were already pacing well above average–spiked up 17 percent after the Bulldogs victory Monday night. The win by Alabama, one of the largest fanbases in professional sports and an SEC rival, only increased demand more. 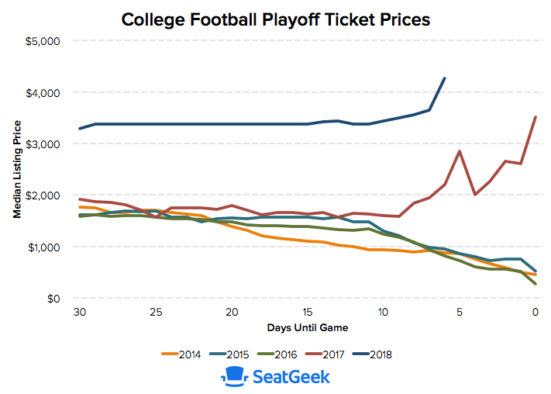 As of Tuesday morning the average resale price of a Georgia-Alabama ticket was $2,634, by far the highest of any College Football Playoff Championship game yet. As a comparison, the 2017 game between Alabama and Clemson had an average resale price of $1,356, and the 2016 game with the same matchup had an average resale price of $607. The 2015 game between Oregon and Ohio State ended up with an average resale price of $845. As shown clearly above, demand for this year’s game was already trending well above average and has only been helped by a matchup that is enticing for a number of reasons. Looking at demand over the past 24 hours on SeatGeek, we have seen interest from all 50 states (and 33 other countries), but 51% of those looking at tickets are based in Georgia. Of course it is impossible to tell how many of those are Georgia fans vs. Alabama fans considering the proximity of both. A quick glance would indicate the prices on the Georgia sideline are a bit higher than those on the Alabama sideline, but much of that could have to do with inventory. It will be interesting to see how prices trend in the coming days. Last year’s game saw some serious price bounces before finishing on the uptick. Interested in attending the CFP Playoffs yourself? Click here to browse tickets on SeatGeek. Image courtesy ikwildrpepper via Flickr.